The gastric sleeve, also known as the vertical sleeve gastrectomy is a restrictive weight loss surgery procedure. During surgery, about 85% of the existing stomach is removed leaving a portion of the stomach that is about the size and shape of a banana, or sleeve. The new capacity of the stomach ranges from about 60 to 150 cc, depending on the surgeon’s final estimation. The outlet valves and nerves to the stomach are left intact meaning that stomach function is not compromised despite the procedure. Much like other weight loss surgery procedures such as gastric bypass, the sleeve gastrectomy is not reversible. 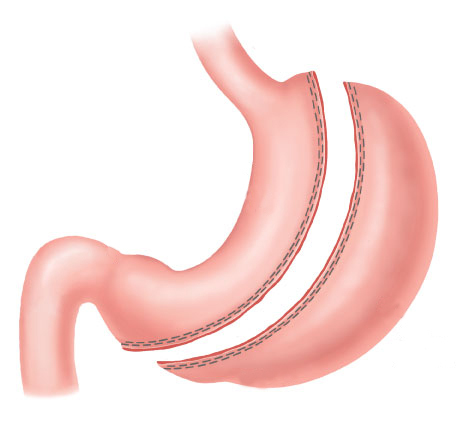 As a general rule the vertical sleeve gastrectomy has been most effectively used for people who either have extreme BMIs or who have surgical consideration that may rule out other types of weight loss surgery. For patients who are extremely obese, the gastric sleeve may be the first of a two part surgery or be performed on its own.